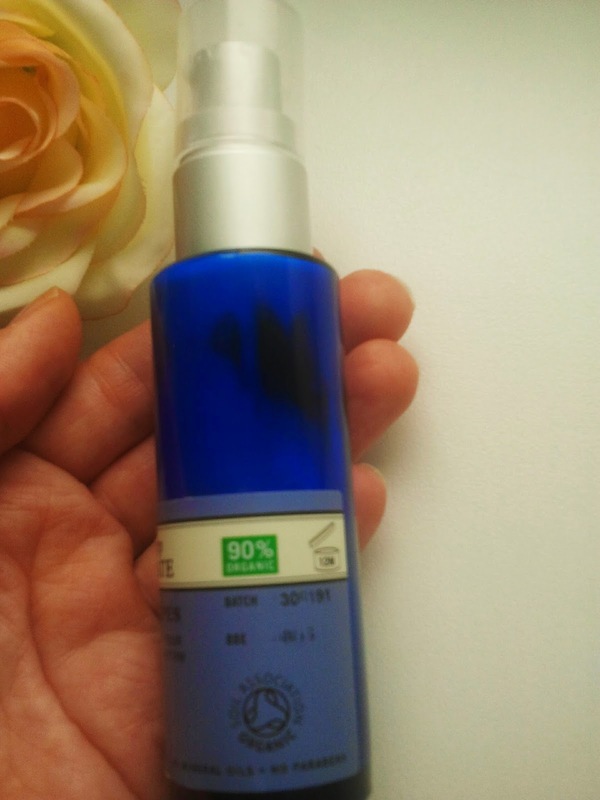 today I would like to review another product from Neal's Yard Remedies. This time it is a Beauty Sleep Concentrate. I have read a lot of positive reviews about this product and decided to give it a try. According to the producer: "our luxurious, lightweight and easily absorbed Beauty Sleep Concentrate has been scientifically formulated to support your skins natural night time regeneration, while helping reduce the appearance of fine lines and wrinkles". This product should support your skin's night time recovery. It should also help to prevent premature skin ageing and refresh and replenish your skin. For me the most important is that Beauty Sleep Concentrate is 90% organic, vegan and cruelty free. It also has fantastic ingredients like: cocoa seed butter, grape seed oil, castor oil, aloe vera, ylang ylang, orange and patchouli oil, etc. I have combination, blemish- prone skin. I was a little bit afraid that this product will cause break out but luckily nothing like that happened. On the contrary I think that Beauty Sleep Concentrate actually speeds up the skin's healing process. After using it my skin feels refreshed, looks radiant and plump. I apply 3 pumps of Beauty Sleep Concentrate on my face and neck. The texture is quite thick but it absorbs very quickly. It doesn't leave any greasy residue. In my opinion it actually could be also used in the morning. Now, another important thing - the smell. 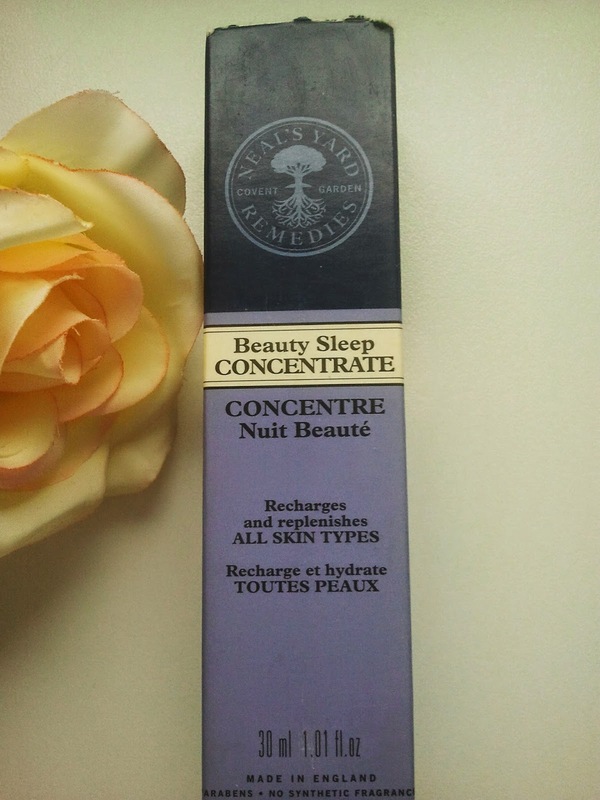 Beauty Sleep Concentrate has an intensive and natural scent that is very different if compared to non organic products. 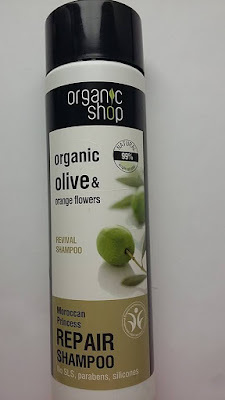 If you don't have too much experience with organic cosmetics be ready for a small shock:). 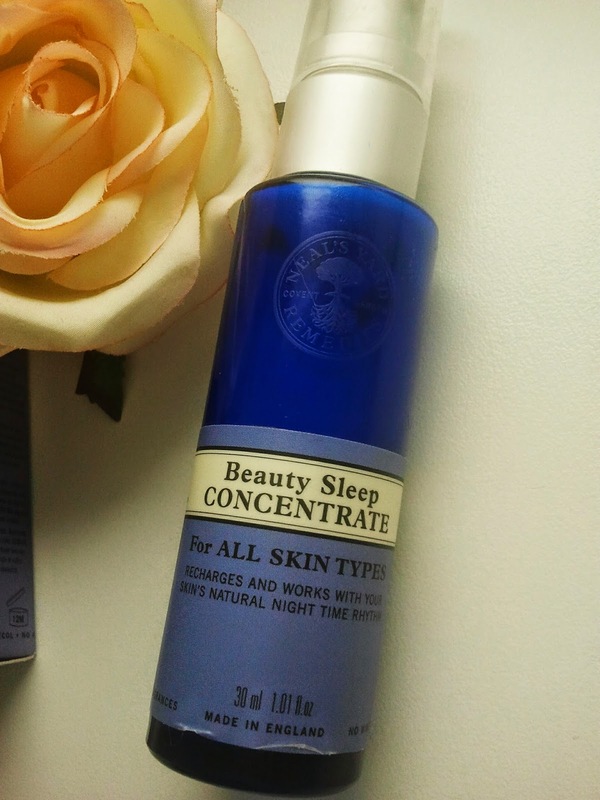 Neal's Yard Remedies Beauty Sleep Concentrate smells strongly of ylang-ylang and patchouli. The scent is relaxing and I have read that they might help you to fall asleep faster:). I can recommend Neal's Yard Remedies Beauty Sleep Concentrate in 100 % to everybody. 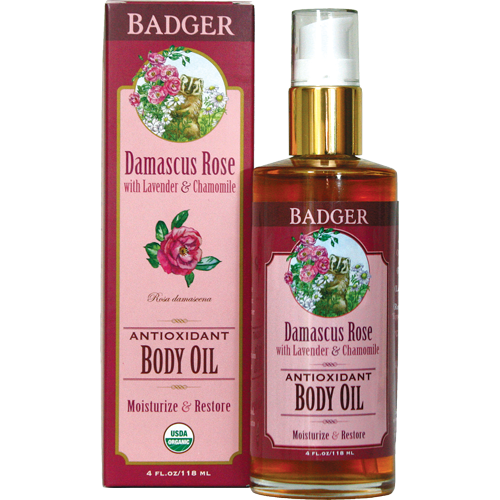 It will moisturize, nourish and heal your skin. 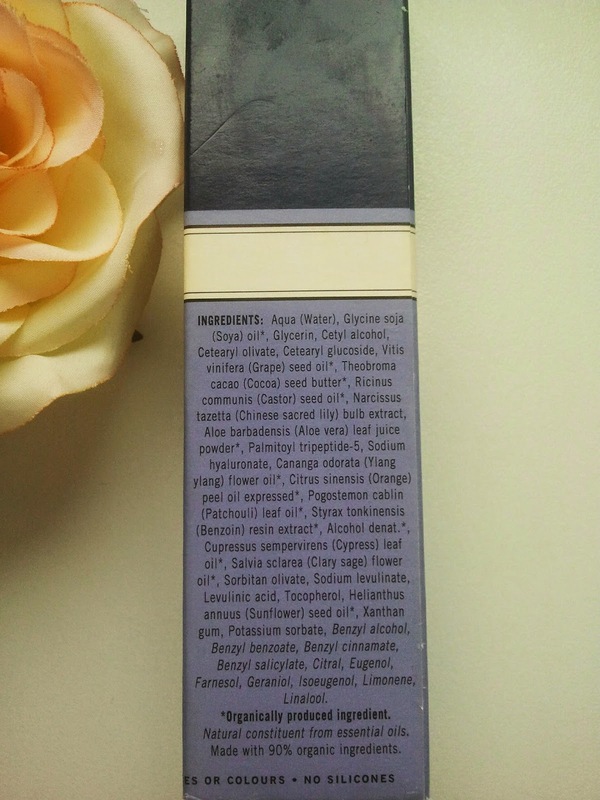 Ingredients: Aqua (Water), Glycine soja (Soya) oil*, Glycerin, Cetyl alcohol,Cetearyl olivate, Cetearyl glucoside,Vitis vinifera (Grape) seed oil*, Theobroma cacao (Cocoa) seed butter*, Ricinus communis (Castor) seed oil*, Narcissus tazetta (Chinese sacred lily) bulb extract, Aloe barbadensis (Aloe vera) leaf juice powder*, Palmitoyl tripeptide-5, Sodium hyaluronate, Cananga odorata (Ylang ylang) flower oil*, Citrus sinensis (Orange) peel oil expressed*, Pogostemon cablin (Patchouli) leaf oil*, Styrax tonkinensis (Benzoin) resin extract*, Alcohol denat. *, Cupressus sempervirens (Cypress) leaf oil*, Salvia sclarea (Clary sage) flower oil*, Sorbitan olivate, Sodium levulinate, Levulinic acid, Tocopherol, Helianthus annuus (Sunflower) seed oil, Xanthan gum, Potassium sorbate, Benzyl alcohol, Benzyl benzoate, Benzyl salicylate, Citral, Eugenol, Farnesol, Geraniol, Isoeugenol, Limonene, Linalool. 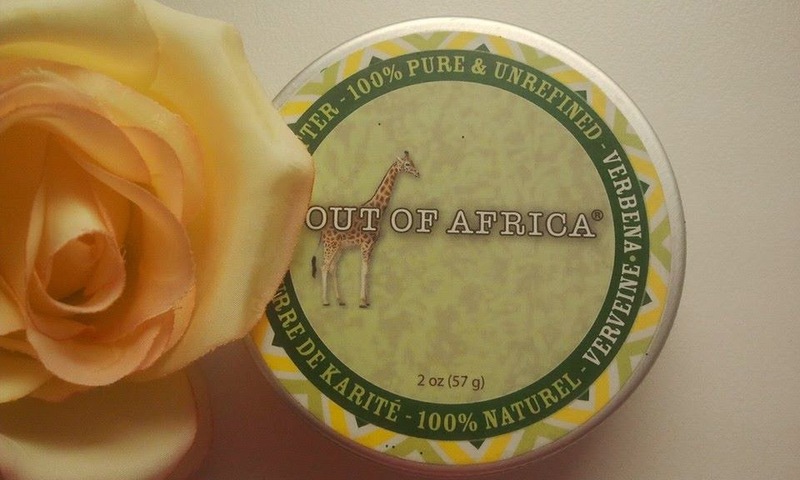 today I would like to review a Pure Shea Butter with Vitamin E from Out of Africa. I like this product a lot because it moisturizes, nourishes and repairs the skin like nothing else. I personally don't like the smell of pure shea butter which is very nutty and strong. That was the reason why I chose verbena scent which smells nice and fresh. It has a delicate citrus scent. According to the manufacturer this product is ideal for all skin types, especially for a sensitive skin and people who have fine lines, wrinkles, stretch marks, psoriasis, and eczema. It is recommended for prevention and reduction of stretch marks, wrinkles and scars. It will also soften the skin and restore its natural elasticity. For the best results it should be used two times a day. I have been using it for my hands because they were very damaged. I was using too harsh washing liquid and pads of my fingers became so dry that the skin started to peel. It looked and felt awful. Regular hand creams wouldn't help at all. But then I started applying Out of Africa shea butter and voila the skin has been repaired. But the shea butter can be used everywhere on the skin where you want it: anywhere your skin needs extra hydration: elbows, knees, hands, etc. 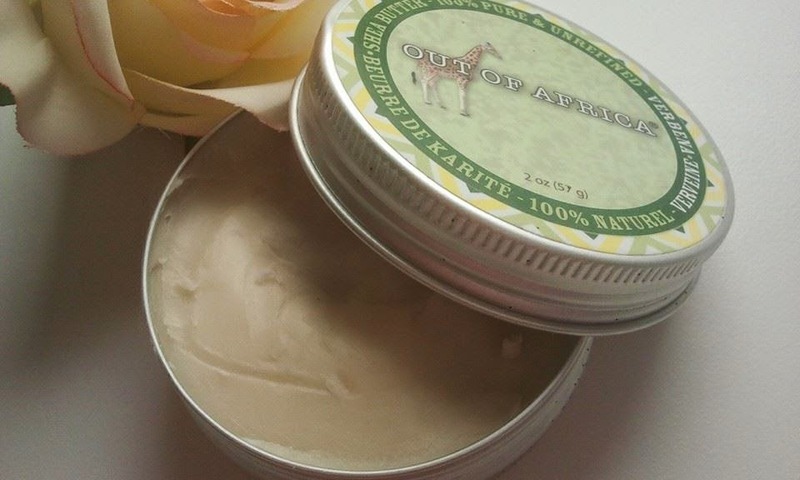 The texture of Out of Africa Pure Shea Butter is thick and rather heavy so it doesn't absorb too quickly. Because of that I would recommend using it when you are at home or as a night treatment. Also be careful with clothing or bed sheets as it may leave greasy stains. We need to remember that pure and unrefined shea butter hardens in cool temperatures and softens in warm temperatures. 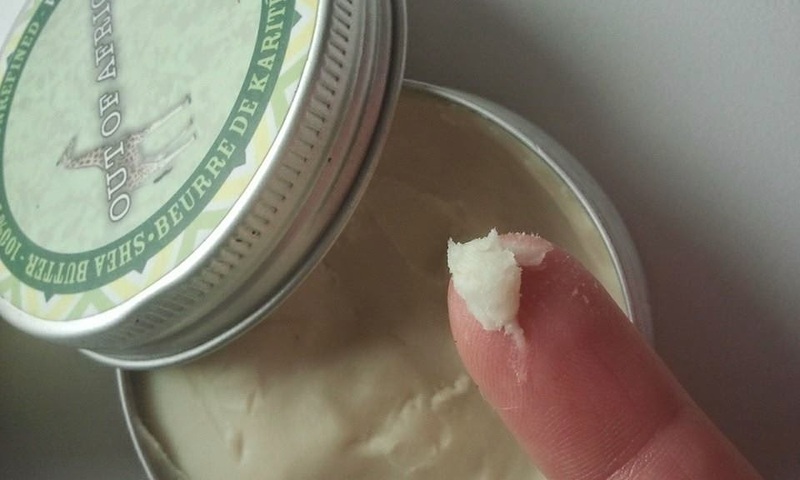 Before the application it is best to rub the product between the palm of the hands for a few seconds. Otherwise the application may be a bit difficult. Out of Africa Pure Shea Butter packaging is very simple yet nice looking, retro-like. The butter is packed in a metal tin. I got my shea butter from iherb because here in Finland pure shea butter is really expensive. For this product I have paid less than 6 euros for 57 grams. Ingredients: Butyrospermum parkii (pure unrefined shea butter), citrus medica limonum (lemon) peel oil, citrus aurantifolia (lime) oil, tocopherol (vitamin E). 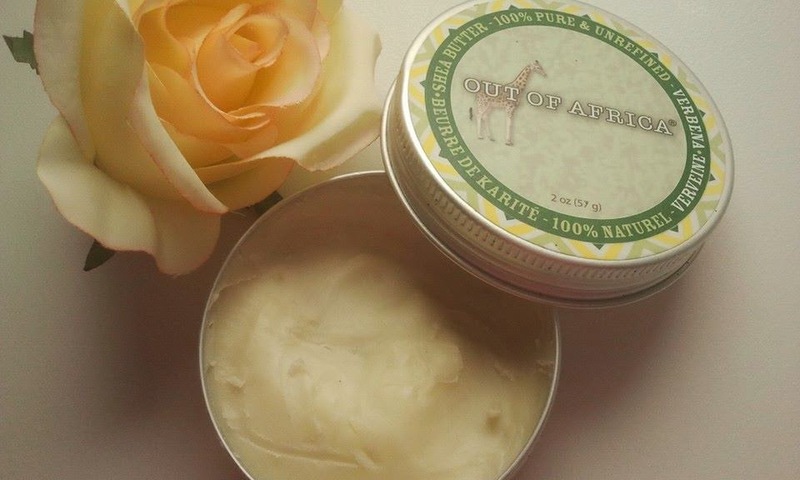 I highly recommend Out of Africa Pure Shea Butter to everyone. It will help to regenerate and protect dry, damaged skin. This little "piece of gold" should be always kept at home.